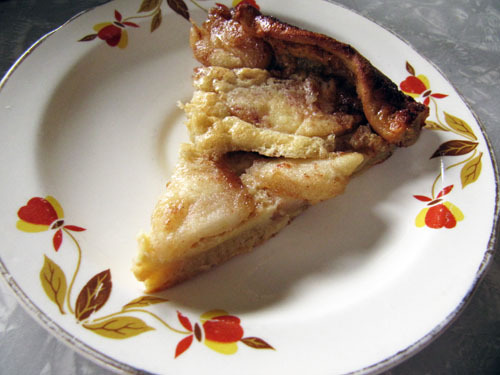 There’s this restaurant that has an apple pancake similar to this. I order it sometimes. And let me tell you, I’m a champ. I’ve finished the whole thing. With that said, I’m trying to be a lady. So I’m saying this serves four. Four ladies such as myself that don’t consider a sliver of this enough, but can’t justify eating this whole pancake on a Sunday while watching the Law and Order SVU scare-a-thon. I used a Jonathan apple in this pancake ecause I have an Uncle Jon with red hair who’s a cool dude and I think Jonathan Adler knows what’s up. P.S. Those are all the ingredients that are in this pancake! 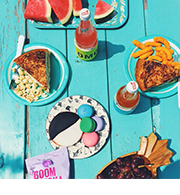 This breakfast isn’t too sweet, but rather just sweet enough. And if it’s not, simply sprinkle it with powdered sugar and get your breakfast on. 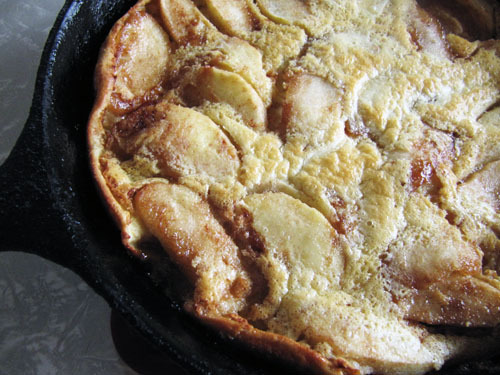 Sizzling apple goodness happens in this pancake. And really … what’s better than that? Maybe you should make this for breakfast and serve it on your only plate that looks like the season. And then help yourself to another piece, because who are we kidding? We just can’t always be ladylike. Preheat the oven to 425°F. In a blender mix the eggs, salt, flour and milk until smooth. Set aside. 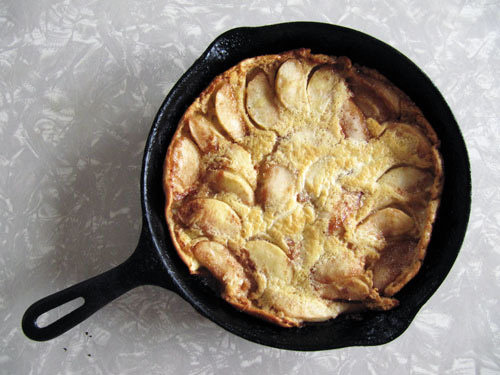 Heat a 10-12″ cast iron skillet over medium heat. Add the butter and sugar to the pan and melt together. Add the apples and cinnamon and toss with the melty buttery goodness. Cook the apples until tender but not mushy, testing with a fork. Smooth the apples out into a single layer and pour the batter over the hot apples directly from the blender. Place the skillet directly in the oven. Bake for about 15 minutes or until the center is set and firm. The pancake will puff up slightly and fall as it cools. Slice into pieces and eat with coffee. Sprinkle with powdered sugar if you like. This pancake can look into one of those super up-close make-up mirrors without fear. 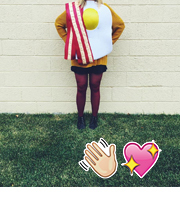 Can I just say that I LOVE your blog? You always have great food! Thanks so much Kara! You have made my day and week and year! Yum yum yum!!! Looks delicious! So how can I bake this without a cast iron skillet? I honestly don’t own one. Its keeping me from getting my soccer mom credentials. 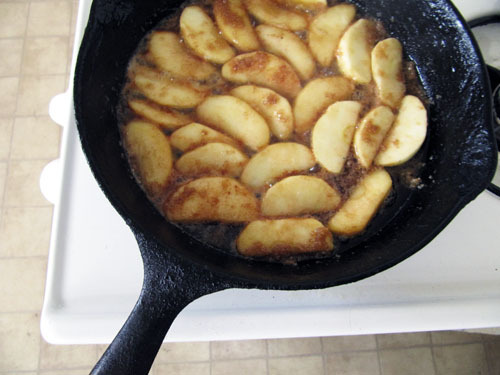 I bet you could saute the apples on your stove top in a frying pan, placing a cake pan to heat up in the pre-heating oven. 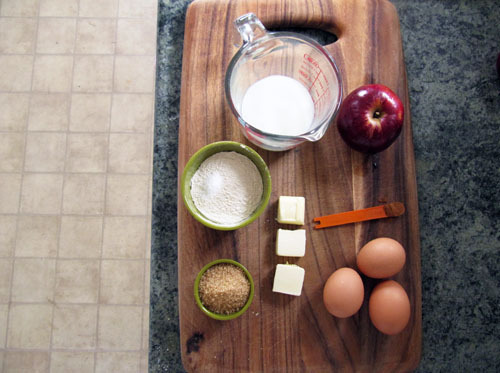 When the apples are softened pour them (and all the buttery goodness) into the warm cake pan. Top with the batter and bake like above.